MOLPORT BLOG: Ready, steady, go - MolPort redesigned online shop is open! Ready, steady, go - MolPort redesigned online shop is open! After all the work this moment has finally come - our new online shop is ready. We have cut the ribbon today and I am inviting you in to have a look around and fill your brand new shopping cart. Here is what I mean - let me give you a tour. Searching for molecules is still just what you were used to - you can text search, browse through the periodic table or draw your desired structure or parts of it. Once you push the search button, you will start to really notice the differences. The search results page will show you the usual basic information and give you an instant clue about how soon you might get to your lab what you need - see the availability tags. Found something interesting? Once you click on the See It button you will find the usual detailed information about the molecule like names and notations. What's new and special comes a bit lower down. We have made some big steps towards helping you too understand from the very start of your purchase what costs how much and what the final price will be. Thanks to improvements in logistics on our part we have split delivery costs according to regions and you can see them immediately for each of the compounds under Shipping and Handling. You will also see right away if there is a minimum order fee for the compound you are interested in. We also want you to know how much you can trust the accuracy of the information about availability of the compounds you are ordering. So, we have added information about last synchronization of our and supplier warehouse databases. Already now we have several suppliers who are sending us these updates daily and we are working hard to convince more and more of them to join. We have also reorganized what you see when checking out what's in the shopping cart. Even though the first summary page will not show you the shipment costs, you can proceed to check out, fill in your contact details to see the order summary which we have sorted by suppliers. Here you can really see what costs how much - price of compounds, minimum order fees, delivery costs from each of the suppliers (or the extra cost of us taking care of putting it all into one handy package so you don't have to deal with receiving several packages and doing customs for all of them), and the total order value, of course. 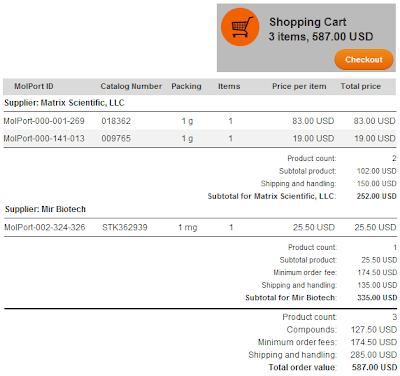 I do really think this is the right way forward how shopping for rare chemical compounds should be done - simple, transparent, convenient, and easy on the eyes for you as a customer. What do you say?